Dr. Nelly Ben Hayoun will be the moderator of the upcoming ‘The Rhizome and the Multiverse’ – the third talk in the Sandberg Series. 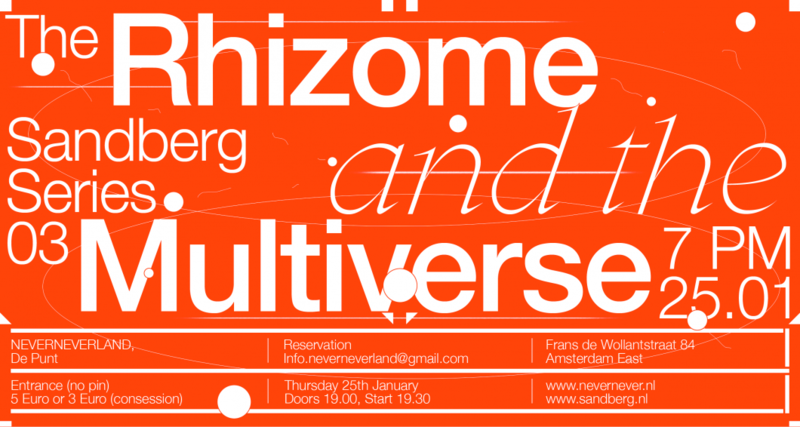 The event will take place at Nevernever Land in Amsterdam on the 25th January at 7:00 PM. This very special talk will be given by Prof. Arjun Appadurai (who will join the audience via Skype) and Christopher Hird. The speakers will discuss research as a human right, globalisation and commodities of knowledge, experimental economical models, schizoculture, political economy and all things multiverse. Prof. Appadurai is a prominent contemporary social-cultural anthropologist, having formerly served as Provost and Senior Vice President for Academic Affairs at The New School in NYC. He has held various professorial chairs and visiting appointments at some of top institutions in the United States and Europe. In addition, he has served on several scholarly and advisory bodies in the United States, Latin America, Europe and India. Dr. Appadurai is world renowned expert on the cultural dynamics of globalization, having authored numerous books and scholarly articles. The nature and significance of his contributions throughout his academic career have earned him the reputation as a leading figure in his field. His latest book is The Future as Cultural Fact: Essays on the Global Condition (Verso: 2013). He is a Member of the American Academy of Arts and Sciences. Christopher Hird is the founder of Dartmouth Films, pioneers in funding, producing and distributing independent documentaries. He is also a former journalist on the Economist, New Statesman and Sunday Times and now on the board of the Bureau of Investigative Journalism and the University of the Underground.